Tribute albums based on childhood nostalgia are by their very definition a dicey proposition. In addition to the fact that even the best tributes tend to come out rather uneven, given the sheer number of bands providing the material, this particular sub-genre also runs the risk of trampling on cherished memories of our most formative years. Even the best among them, including Schoolhouse Rock! Rocks or Saturday Morning: Cartoon's Greatest Hits, only feature a few truly memorable versions, filling out the remainder of their track listings with covers that, more than being bad, are simply boring. 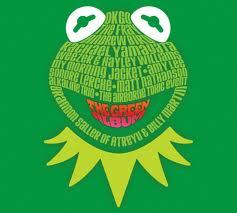 At times, Muppets: The Green Album falls into those same traps, but it's also elevated by the sheer quality of the songs as written. It doesn't really matter if an act's take on a song is unimaginative, as with Alkaline Trio's "Moving Right Along", the strength of the endlessly hummable original shines through. There are a couple of tracks however that are eminintely skippable, chief among them Amy Lee's torpid interpretation of "Halfway Down The Stairs". But mostly The Green Album is a charming, likable time-waster, perfect to spin a few times on a lazy summer afternoon and then forget about completely. Well, maybe not completely, as the few tracks that really stand out, like My Morning Jacket's "Our World" or Andrew Bird's gentle rendition of "It's Not Easy Being Green" wouldn't sound half-bad rounding out a mix-tape or coming up on shuffle. And really, isn't that all anybody should be asking from an album like this? Unless of course, you work in Disney's marketing department, in which case you should also be asking it to build hype for The Muppets, due out this Thanksgiving.